Courchevel Moriond. This chalet is located in a tranquil hillside setting with truly wonderful views and it is only 500 metres (approx.) from the centre of Courchevel Moriond (formerly Courchevel 1650). The chalet is also only 300m (approx.) from the escalator which takes you straight to the centre and the lifts. Therefore, not only are the shops and bars of this great resort close by, so too are the Ariondaz and Marquis lifts, as well as the slopes of Courchevel and the Three Valleys. Early booking is strongly recommended as chalets of this high calibre in such a superb location are rare. We update Chalet Estrella's details often, but facilities do change. e.g. some extras listed by the supplier as "free" or included might only be for the first time you use them, or for one time per party, then charged for further use. If any specific feature is essential to your holiday, make sure you ask us to confirm the details of it before you book your holiday. This all inclusive holiday to Chalet Estrella in Courchevel, France departs Saturday 14th December 2019, for a 7 night stay on a "catered chalet" board basis. A local tourist tax (Taxe de Sejour or Kurtaxe) is levied by many councils in European ski resorts. It varies by standard and type of accommodation and is age dependent, so not everyone is charged. It's not included in the basic price of your holiday and is usually paid locally. For reference, the average charged in winter 15/16 was between 50p and £2 per person, per night. Courchevel lift pass price last reported as €218 (adult 6 day). Ask for a quote when booking Chalet Estrella. 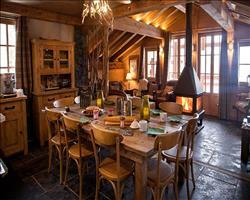 Chalet Benjamin Courchevel France, Gatwick to Grenoble 14th December. 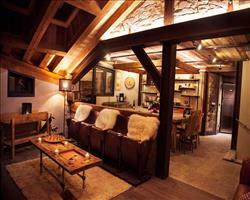 "Beautifully refurbished, the best chalet I've stayed in"
This chalet is really lovely. It’s been very recently refitted and it’s beautiful inside. All the rooms are ensuite and all are a similar size (some chalets have tiny little box rooms with bunk beds, not this one). There’s a great hot tub outside and a nice boot room. The communal room is really nice with a big corner sofa, a TV and a balcony. We were really pleased with it. I’ve been on about 20 chalet holidays and this is probably the nicest chalet I’ve ever stayed in. I would go back. The only thing that wasn’t ideal was that it was a bit of a walk to get to the escalator that takes you up to the lifts. You can rent lockers at the top of the escalator so I would recommend this, then you don’t have to carry your stuff. The staff were great and made lovely food. The hors d'oeuvres were nice and they served aperitifs before dinner (champagne based cocktails, etc). The only thing was that the main courses were a little heavy, but that’s common on ski holidays. They made a real effort overall. We came in a large group with children and the staff were very helpful with the kids. They did a nice children’s meal with simpler food and they made sure they were happy during dinner, etc. "Lovely chalet, catering could be improved"
Lovely chalet with very attentive and polite staff. My only criticisms would be the catering. Evening meals were well presented but not necessarily to everyone's palate and portion sizes were a bit small. We had a very good week, the chalet staff were fabulous and very helpful. The only thing that we thought wasn’t great was that on the last day, there wasn’t any breakfast served in the morning before we left. Apart from that, the staff were very good. They organised a physiotherapist for me when I injured myself and tried to accommodate everyone’s tastes with the meals throughout the week – the food was great. It was a little trek to get to the slopes as the chalet’s down at the bottom of the hill but we’ve been spoiled for many years as we’ve always stayed ski in/ski out. We have just returned from Christmas spent in Chalet Estrella. Absolutely fabulous! The chalet hosts, Lara, Beth and George were amazing, friendly, welcoming, brilliant chefs and couldn't do enough for us. The chalet itself was clean, comfortable, attractive and centrally located. The hot tub too was a huge hit! We had a great week and definitely plan to go back! Generally a really nice looking chalet with a great view, rooms are a bit small and could do with a bigger locker room for skis and boards as we couldn’t fit ours boards into any of the racks. The menu could do with a makeover and employing a chef would help greatly but hosts where really good. As for location there isn’t much to do around 1650 and it’s a bit far to walk to the closest lift which is made especially harder when the escalator upward isn’t working every morning and you’re carrying all your gear. If I was to go to Courchevel again I’d recommend to stay at 1850 but if you’re looking to hit the 3 valleys go to Meribel you get the best of all 3 without having to overly worry about times to get back from Val Thorens. "Great place to stay in the 3 Valleys"
Welcoming and large, is how to describe this Les Trois Vallee chalet at its best. Wood and stone designed, but with a beautiful modern twist once inside, it is perfect for lounging about in after a long day on the hill. Luxury is matched by seclusion but not isolation, as the ski bus is just fifty yards away. The piste and lift area are a further 300 metres away, and the town centre around 500 metres. Close enough to the fun, but far away enough to be undisturbed if you want a quiet night in. 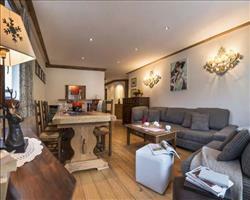 A well placed chalet in good value Courchevel 1650. Unfortunately the chalet is well short of 4* luxury. The fireplace has a handful of gel burners,the food was poor and the rooms very small. All this pointed to the staff who tried, with enthusiasm but fell short to deliver a quality experience. The skiing was great and weather kind. Complaint to head office [chalet operator] was fruitless but this chalet needs to up its game and at least meet a 3* delivery. A shame the staff are not better supported, they new the problems with food, a fake fire and tatty lounge area. !